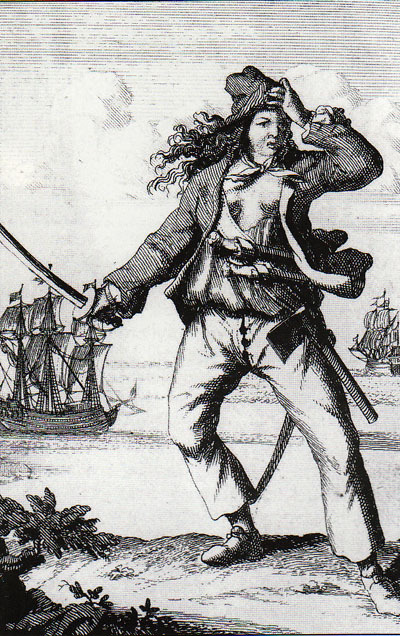 One of the most famous female pirates of all time, Mary Read was born in 1691 in England, the illegitimate daughter of a captain’s widow. She had a legitimate brother from her mother’s marriage. When he died, worried about how to make ends meet, her mother dressed Mary as a boy so the family could keep receiving financial support from the boy’s grandmother. That’s how Mary became Mark. Grannie was fooled and kept paying until her death. Then, much to her mother’s dismay, Mary decided she preferred the clothes and life of a man to those of a woman. Men had more freedom and more opportunities. But her shocked mother didn’t agreed with her choice and disowned her. Undaunted, Mary found work on a ship, and then she joined the army, where she proved her worth as a soldier. It was on a campaign that she met her husband. A Flemish soldier, he took an early retirement and together they opened up an inn called The Three Horseshoes in the Netherlands. Happy and in love, Mary started dressing like a woman again. But her marriage was short-lived. When her husband died, a sad Mary closed the inn and put on her favourite men’s clothes again. She joined the army again, but when peace was declared, opportunities for advancement ran out. So, Mary, still disguised as a man, boarded a merchant ship bound for the West Indies. When her ship was taken by pirates, she joined them. She then took the King’s pardon and a commission to privateer, which came to an end when she joined the crew in mutiny. 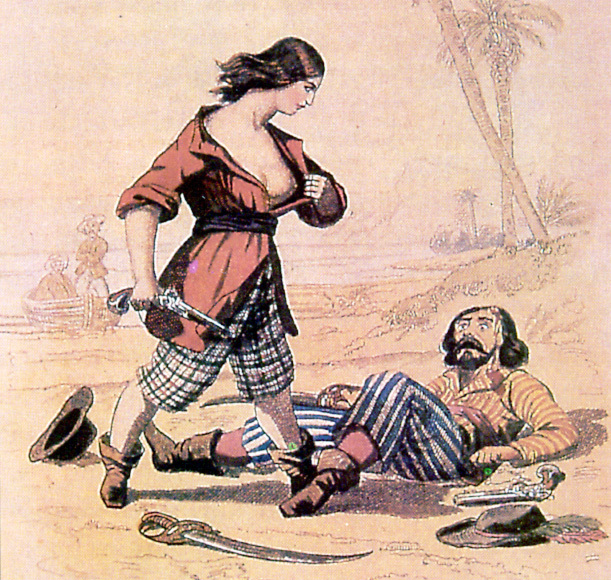 She then joined the famous pirates John “Calico Jack” Rackham and his companion, Anne Bonny. Anne soon developed a crush on Mark, aka Mary in disguise. So Mary, both to avoid Anne some embarrassment and being killed by the jealous Jack, revealed to them her secret. The truth didn’t ruin the women’s friendship. They were now closer than ever. Then, Mary fell in love again. He was a sea artist forced to join the pirate’s crew. One day her lover was challenged to a duel by another, more experienced pirate. 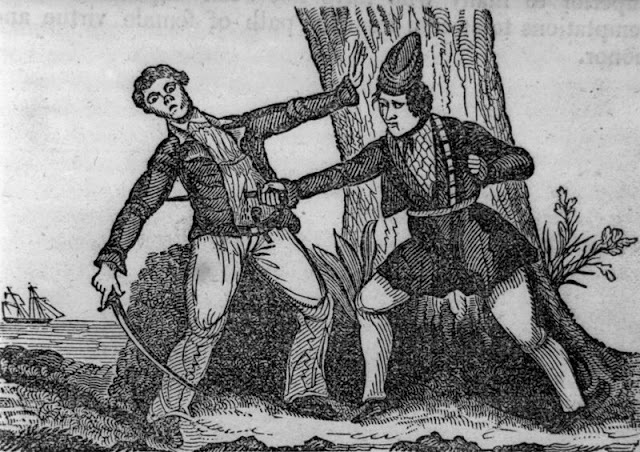 To save him, Mary started an argument with the pirate, which turned into a duel. She killed him. In October 1720, pirate hunter Captain Jonathan Barnet captured their ship. Rather than fight, the crew hid inside. Only the two women, Mary and Anne remained on deck, ready for battle. Mary was livid at this and shot two sailors and injured Captain Jack. An hour later, Mary was a prisoner. Taken to a Jamaican jailed, the two ladies pleaded to be pregnant to avoid execution. We’ll never know if Mary really was with child. That may have saved her from the noose, but not from illness. Mary, while in prison, caught a bad fever and died.